Habitat for Humanity LBPC is hosting a free "Competent Person Safety Training" for all interested volunteers in our three county area. This certified training is led by a Habitat for Humanity International's Construction Safety trainer and will be offered free to any of our interested volunteers. People from neighboring Habitat affiliates will be charged a fee. This workshop will be held at Trinity Lutheran Church, 717 Chambers St., Ottawa. This two day course (8:00 am - 5:00 pm) will be on Thursday May 23 and Friday May 24. Course materials, lunch and snacks will be included. The training sessions will cover fall protection, scaffolding, job site electrical safety, stairways and ladders and PPE and tool safety. At the conclusion of the course, attendees will be tested and certified as a "Competent Safety Person". This certification is an OSHA requirement A certified Competent Safety Person will be on all our construction sites to ensure the safety of all of our volunteers and our partnering family members. Class size is limited so be sure to register before class is filled. To register by email or to ask questions, please contact Sally M Van Cura, Executive Director at (630) 502-9400 or email vancura@uscss.com. Please like and share our facebook page. Michael Wright is a disabled veteran with three overseas deployments. 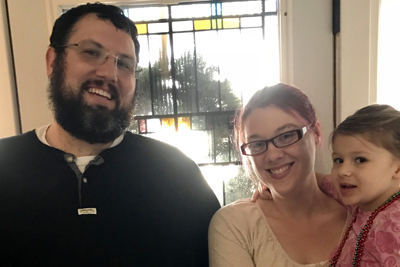 Their family of six has purchased a home in Streator. The furnace was old and unable to keep their family warm this winter. They turned to Habitat for Humanity of La Salle, Putnam and Bureau Counties for help. When the HFH board of directors heard of the Wright's dilemma, they immediately put the Habitat home-owner repair project in motion. Michael and Cassandra Wright are shown in their Streator home. One of the board's 2019 goals is to offer a hand-up to local veterans. 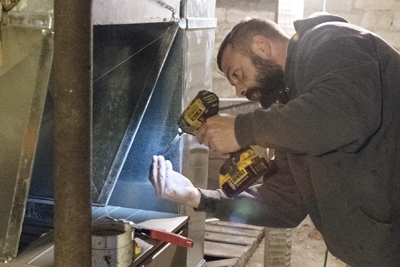 When Bob Goskusky, owner of Town and Country Services was contacted by Habitat executive director Sally Van Cura, he immediately produced a plan to install a brand new Bryant furnace. Town and Country Services is a local family owned business that has been serving our community since 1919. The Wrights are now comfortable in their home and are wishing everyone a Happy New Year! Rick Spangler of Town and Country is shown installing the new Bryant furnace at the Wright home in Streator. More information is available on our local chapter facebook page. Our next family will be selected for a Habitat home in 2019. Habitat is raising money for this home. The next home (#15) will likely be on the south side of Ottawa. Please follow this web site and local media for details. Habitat for Humanity-LBPC and the James and Lenka Coyne family have partnered together. The Coynes have moved into a like-new rehabbed home on Shabbona St. in Streator. James is a veteran and currently works for Caterpillar in nearby Pontiac. Lenka is a full-time homemaker. This Shabbona St. home is the second rehabbed home our local Habitat affiliate area and the fourteenth in our three county area. The first twelve houses were new constructions made to the specifications of the partnering families. This project was made possible by the generosity of the Margeret Kashak family and many other generous donors. Please go to our Sponsors page to see a list of many contributing organizations and some of the individuals. Our Habitat affiliate President on this project and two previous homes was Rich Larson. Janie Larson served as Executive Director. The Project Manager for this home and one previous Habitat home was Jeff Coyne. Habitat owns lots in La Salle County and Bureau County and is preparing for project # 15. Habitat, through our Brush with Kindness program, has installed new windows, repaired foundations and installed new roofs and porches for existing family homes. Please Contact Us us about qualifying if you are interested. Habi tat for Humanity- LBPC and the Enrique and Ashley Diaz family of four have continued partnering with Habitat and now live in our first ever rehabbed home. 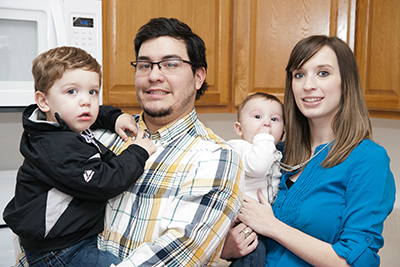 Enrique and Ashley along with two year old Reece and baby Graham (left) are in the kitchen of this fourth Streator Habitat home. 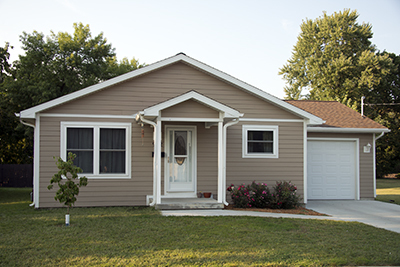 Habitat volunteers completed the finishing touches on this home, late in 2014, which has all new electrical, plumbing, insulation, drywall, kitchen cabinets and counters, kitchen and laundry appliances along with new exterior siding, and roofing. The home is energy efficient with a new furnace and air conditioning unit. Pictured is a photo of this Hall St., Streator home. Our next family will be selected for a Habitat home in 2019. Habitat is raising money for this home. The next new home (#15) will likely be located on the south side of Ottawa. Please follow this web site and local media for details. Submitting a completed Habitat Homeowners Application allows our Family Selection Committee to evaluate the needs and qualifications of interested families. Habitat provides help with filling out applications. Some of our many local partnering homeowner families are single adults. Some of our families are large families. Some of our families have had severe financial difficulties in the past. Habitat does not discriminate in any way. If you are interested in a Habitat home, please follow the procedures described below. Interested families will ask for and receive applications as a pdf file attached to an email or by regular mail, or you can download it and print it by going to the Homeownership page on this web site. Our mailing address can be found on the Contact Us page of this web site, or you may call 815-434-2041 or email habitat628@att.net. Please contact us if you have any questions. 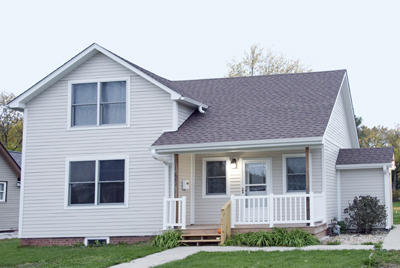 Habitat homes are built or rehabbed in partnership with future homeowners. All homeowners are required to put in many hours of "sweat equity" where they are hands on with the building process. After making a down payment of about $750, the family is provided a no-interest paid mortgage. The annual income requirements for the Streator home ranges from $30,000 to $55,000 depending on the size of the family. Please check our Homeownership page in this web site for more information. 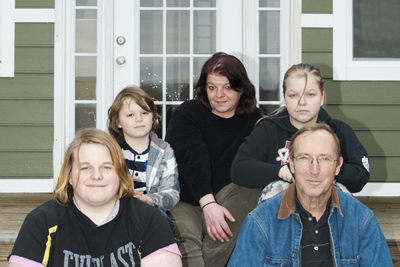 Late in 2012, Habitat for Humanity -LBPC selected the Snell family of Ottawa for the new 912 W. Superior St., Ottawa home. The Snell family qualified and consented to partner with Habitat and then moved into their new home. Ms. Snell is a single mom with three children. Their picture appears on Local News. A number of families applied and were considered by the Family Selection Committee. Home visits were made, financial records were reviewed, applications were studied, interviews were conducted and a family reccomendation was made to the HfH-LBPC Board. The Snell family was then approved and accepted. 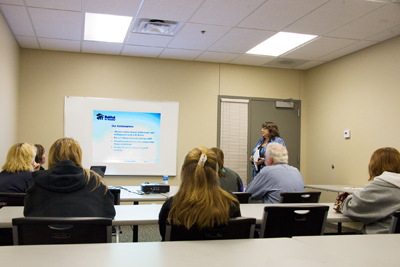 Janie Larson (Past-Executive Director) is shown leading one of several Habitat informational meeting in Ottawa. This was part of the process that lead to the eventual selection of the Snell family. The Ottawa Township High School Building Trades Classes under the direction of instructor Mr. Dave Keely were largely responsible for framing, roofing and sheeting the 912 W. Superior Street, Ottawa house (pictured at the top of this page). Many volunteers worked on interior construction and painting in this home. Please check our Properties page on this web site to view ten Habitat single family homes and one duplex that have been built for local families starting in 1996. Mr. Dave Keely and HFH-LBPC Project Manager Mr. Mike Knapp served as Co-Site Supervisors on this project. 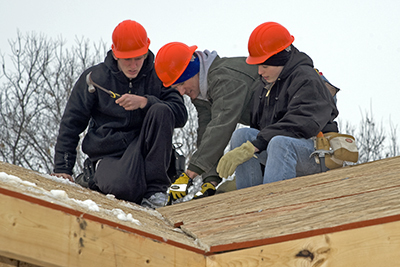 This is an Ottawa Township High School Building Trades Class with instructor Mr. Dave Keely (center), Sean Clark (left) and Brandon Haerleas as they complete roof sheeting on the 912 W. Superior St., Ottawa home. Three O.T.H.S. classes have worked on this project. LaSalle, Bureau and Putnam Counties HFH is a locally run affiliate of Habitat for Humanity International, a nonprofit, ecumenical Christian housing organization. Habitat for Humanity works in partnership with people in need to build and renovate decent, affordable housing. The houses then are sold to those in need at no profit and loans are provided interest free. Volunteers provide most of the labor, and individual and corporate donors provide money and materials to build Habitat houses. Partner families themselves invest hundreds of hours of labor - "sweat equity" - into building their homes and the homes of others. Their mortgage payments go into a revolving Fund for Humanity that is used to build more homes. Sally Van Cura is our Executive Director. Dan Fitzgerald is our Acting President; Heather Johnson, Vice-President; Lee McCullough, Secretary; Patricia (Pat) Reed, Treasurer, Rich Larson is our Past-President. Our staff consists of: Fran Gibson, Office Administrator & Jeff Coyne, Construction Manager. Are you interested in becoming involved with Habitat for Humanity-La Salle, Bureau & Putnam Counties? Habitat for Humanity-LBPC is always looking for people interested in our mission to provide affordable, safe housing. We are in need of people with backgrounds in real estate, public relations, social work and home construction. We also have a need for people with a passion for building relationships for this mission. Please contact us if you are interested in finding out how to be involved with Habitat for Humanity-LBPC. We can be reached at our office at 815-434-2041 or fill out the form on our Get Involved page.